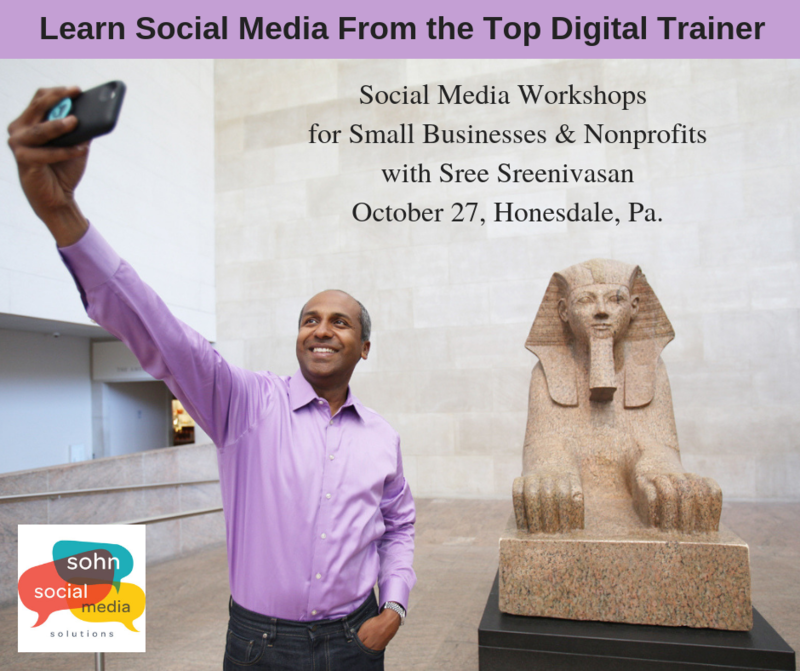 More Than 50 Businesses & Nonprofits Attend Social Media Workshops in Honesdale, Pa.
HONESDALE, Pa. – It was a packed room at the award-winning Stourbridge Project in Honesdale on Saturday, Oct. 27, when Sree Sreenivasan, social media coach and consultant and former chief digital officer of The Metropolitan Museum of Art, The City of New York and Columbia University, spoke at two workshops – Social Media for Small Business and Social Media for Non-profits. These two workshops, which went from 10 a.m. to 1 p.m. and 2 p.m. to 5 p.m., was a collaboration between Tim Sohn, CEO and founder of Sohn Social Media Solutions, and Sreenivasan. Sohn Social Media Solutions, based in Shohola, Pa., helps businesses and nonprofit organizations increase sales and exposure through social media, public relations and other online marketing services. “It was a pleasure to work with Sree and his team on bringing these workshops to Northeast Pennsylvania. We had some folks come from as far away as Philadelphia. I have known Sree since 2013 and have attended his events since then. Sree’s workshops are always engaging and include lots of tips that you can try right away,” said Sohn. Steffen Kaplan, owner of Spin It Social and a former photo editor at The New York Times, came with Sreenivasan and provided his tips as well. Some participants provided their feedback to the workshops in social media posts: “Great social media class this morning with Sree Sreenivasan. If you don’t know who Sree is, check out his TED Talk. Thanks Tim Sohn for putting this event together,” posted Lisa Bercze, vacation specialist at TripGuy Travel. For more information about upcoming workshops, or if you have a suggestion for a topic or a speaker, contact Sohn at tim@sohnsocialmediasolutions.com. Like Sohn Social Media Solutions @sohnsocialmediasolutions on Facebook and Instagram and @sohnsocialmedia on Twitter. Connect with Sohn on LinkedIn at http://www.linkedin.com/in/timsohn. Call/text to Sohn Social Media Solutions at (973) 255-8110. Sree’s 2018 World Tour is making a stop in Honesdale, PA, at The Stourbridge Project on Oct. 27, 2018. Don’t miss out on this chance to hear about social media for small businesses and nonprofits, apps and more. Sree Sreenivasan (@sree on Twitter and @sreenet on Instagram) is a leading consultant, speaker and trainer for nonprofits, corporations, startups and executives. He has been Chief Digital Officer of major institutions in multiple industries: City of New York (working at City Hall); Columbia University; and the Metropolitan Museum of Art (leading a 70-person team that helped keep the 150-year-old institution relevant in the smartphone age). Before joining the Met, he spent 20 years as a full-time professor at Columbia Journalism School. He was named one of Fast Company’s 100 Most Creative People in Business in 2015; the world’s most influential Chief Digital Officer by CDO Club in 2016; and one of Poynter’s 35 most influential people in social media in 2010. He is a contributor to CNBC’s “Squawk Alley,” appearing monthly to talk tech. There will be two social media workshops, one for small businesses and another for non-profits. To sign up for the Small Business workshop, go to sreepabiz.eventcombo.com. Questions? Contact Tim Sohn at 973-255-8110 (call/text) or tim@sohnsocialmediasolutions.com.